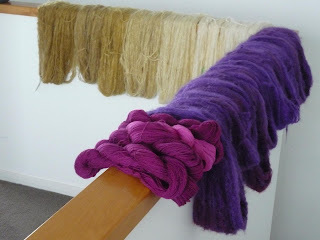 I had a very enjoyable day at the Creative Fibre Festival "Twist in Thames" on Saturday which was open day. Met up with lots of friends and spent money I shouldn't have on stash enhancement. While there a friend suggested I should post on the blog more often so I'll try but I do like to know someone is out there reading it! First off I should have mentioned that the hat shown here knitted from thrums sold at the Whangamata market. 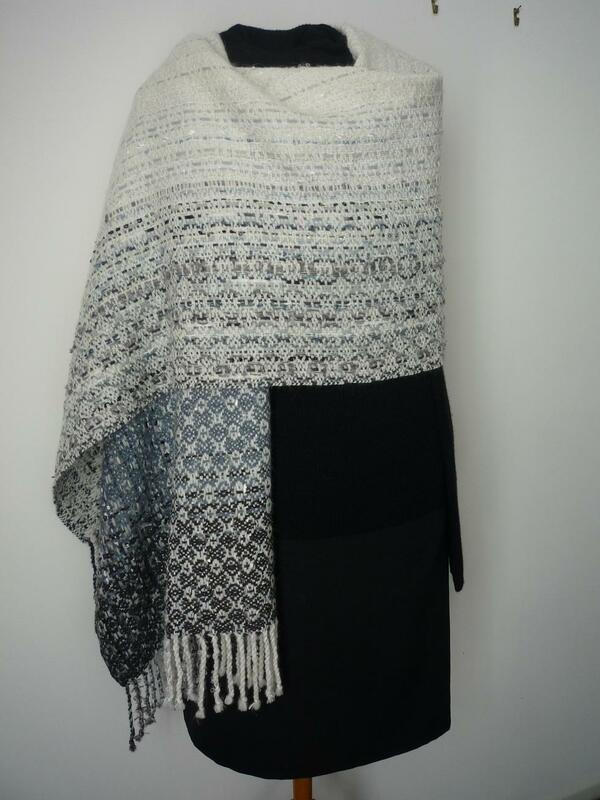 Of course the buyers husband said, why do you want to buy that, you can knit yourself, and the lady rightly replied yes, but I could never get the colours. 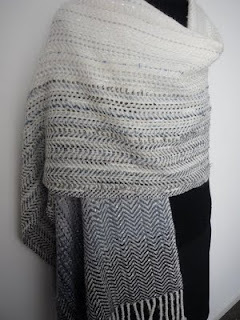 It was hand dyed many shades and tints of a wedgewood blue with bits of quarry grey and dashes of white where the warps had been tied all adding up to a great combination. I've got myself into a bit of a corner this week in that three looms have to be threaded. Hopefully Tuesday or Wednesday the computer box for my dobby will be delivered and installed which meant I had to have a 16 shaft threading on the loom to test it. This is half way in dreadful light as a "almost" cyclone was heading our way. Every second thread is a variegated merino in berry shades and quite rich and the alternate threads are a bordeaux shade. I'm threading a network twill and going to sample turned taquete as this is a technique I've wanted to explore for some time but having trouble finding much information. I'm gradually piecing together how to arrive at the tie-up, treadling, etc. 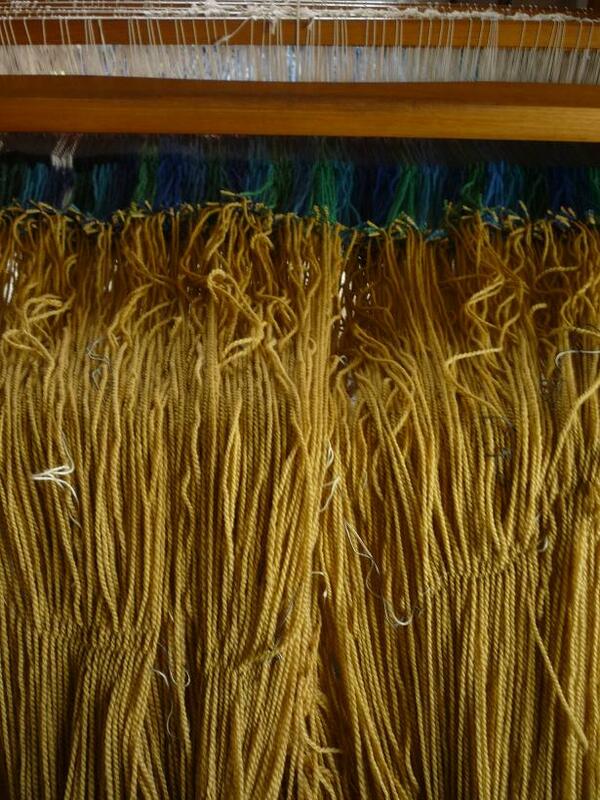 Loom number two is always threaded for blankets and I tie on the new warp. Again dreadful light but you can see the white cross threads I use to keep everything in order. This gold will be crossed with one blanket, gold to cream and the other in purple. What would I do without the stairway railing to dry skeins on. The berry skeins are the weft of yet another project, summer and winter scarves, that I really should have been working on before the immanent arrival of the "box". Its next, I promise. One of these wraps was a commission. 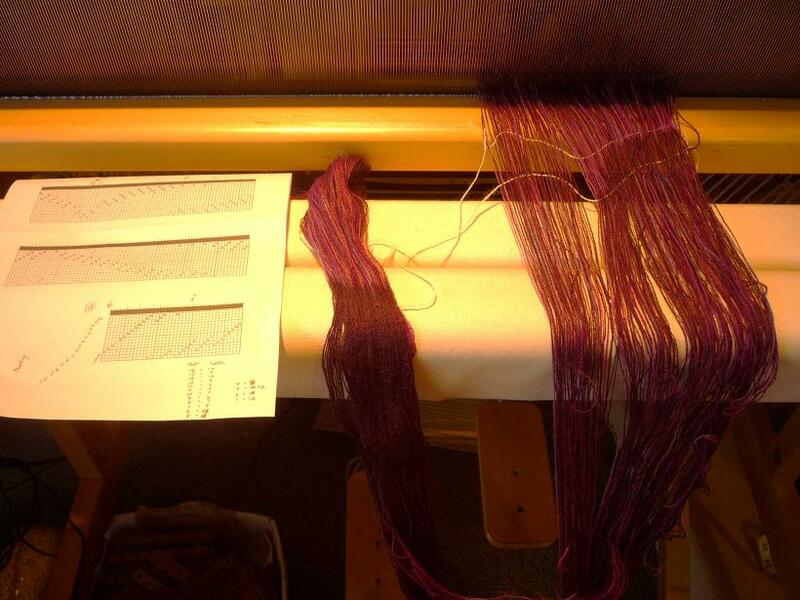 When I started winding the warp I thought it was so pretty I wound enough for two. I started weaving the top version and remembered the lass had said she didn't like spots so wove the second in chevron which she chose. She didn't suit grey next to her face so I arranged the colours so the soft winter white could be uppermost but still keep neutral grey. 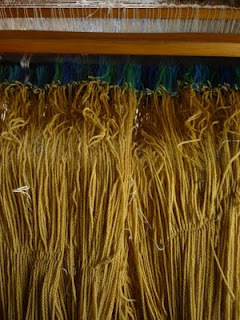 Lots of different threads in the warp and the weft a soft angora at about a 4 ply in kiwi terms. I'm reading! I check every day (yes, really). The scarves are beautiful, but me, I prefer the spots! Keep on blogging, there are loads of us there lurking. Computer Box! :-}}}}}} Love your achromatic piece, too. Nice to know you're there Joanna but every day? I can't weave that fast. Well done Dianne, cant say I read everyday but once a week maybe!